After exhausting hikes on hot summer days you can enjoy a break or a jump in one of the cool lakes of Tyrol. There are several lakes in the beautiful landscape of Tyrol, which are perfect for a jump after a hike (in the pic Lake Kaltwassersee in the surroundings of Seefeld). Bigger lakes like Lake Achensee offer various activities such as sailing and windsurfing! Lake Krummsee at Kramsach is one of the warmest lakes for bathing in Tyrol. 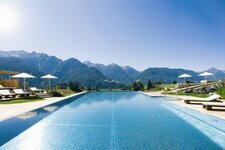 Lake Lans, located at 980 m asl on the outskirts of Innsbruck, is a popular bathing lake. Lake Lauchsee in the beautiful Pillersee valley is a popular lake for bathing and fishing. Lake Obernberg is a mountain lake located at 1,590 m asl in the Stubai Alps in Tyrol. Lake Reintaler is the largest lake in the so-called “Kramsacher Seengebiet” area. The reservoir of Durlassboden stretches in the Austrian states of Tyrol and Salzburg. Lake Stimmersee is an artificial lake at Langkampfen in the district of Kufstein. Lake Trams above Zams and Landeck is a popular lake for bathing. Lake Urisee is a little lake for bathing in the surroundings of Reutte.